Stevia is a tender perennial grown as a vegetatively propagated annual. Parent plants brought through winter indoors provide rootable stems in spring. Not generally needed. If needed, a water soluble fertilizer can be provided in midsummer to invigorate plants. Thyme and Marjoram. 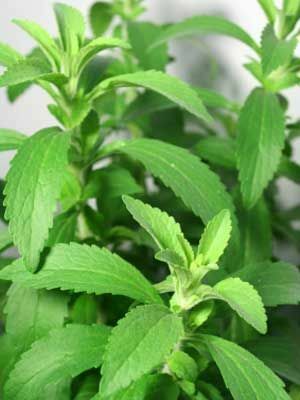 Stevia is an upright plant which goes with mound-forming herbs. Start with a purchased plant, because stevia seeds are very reluctant to sprout. Plants are grown from rooted cuttings taken from greenhouse-grown plants. Gather sprigs as needed in the kitchen. Gather stems for drying in midsummer, just before the plants bloom. Stevia thrives in warm weather, and may grow slowly under very cool conditions.